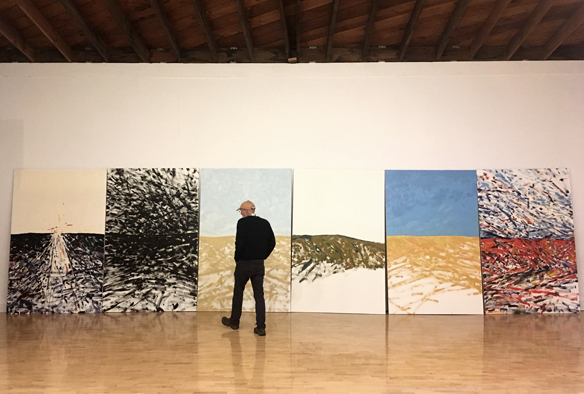 Sandy Walker with his painting "Wyoming Earth/Sky Frieze"
"... force, energy, and urgent gesturing of the human body have steadily informed both the imagery and process of Walker's engagement with art... He is at once a romantic, an abstractionist, and an expressionist, taking the majesty, monumentality, and pulse of nature - trees, mountains and rivers, and oceans - and giving them back to us in a dialogue of form." - Janice Ross, from 'American Visions: the Paintings of Sandy Walker'.
" Mr. Walker's figure studies bring together a heavily loaded brush, bravura confidence, an openness to chance, and perceptual acuity. His bold, easy humanism offers action painting without angst." - David Cohen. Sandy Walker is a painter, printmaker and visual artist, living and working in Oakland, California.